Certified translations, also known as sworn or official translations, are those made by a certified or sworn translator. In Spain, certified translators are appointed by the Ministry of Foreign Affairs and Cooperation. Certified translations must bear the stamp and signature of the sworn translator in order to be granted official status for institutions and public administrations. In this sense, the function of a certified translator is similar to that of a Notary Public, because he certifies the accuracy and truthfulness of the translations and bestows on them legal validity. Public agencies (university, court, ministry, embassy…) may occasionally request a document to be translated officially, i.e. 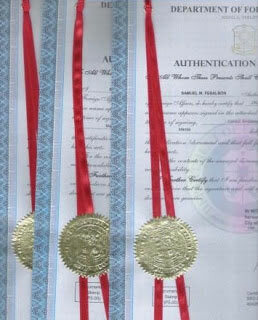 to bear the stamp and signature of a certified translator for that document to have legal validity. For instance, are you a foreing citizen living in Spain and need to process your work/residence permit or family reunification?, have you studied abroad and need your studies to be recognized in Spain?, are you a lawyer and need and interpreter to communicate with your client or to translate a statement in a trial In that case, please contact me to be able to decide on your needs and provide you with a high quality, fast and economical service. 1. Delivery of document to be translated: this can be delivered personally (at my office in Palma de Mallorca) or by email. If you scan the document, please make sure that the entire text is clearly visible. Once the document is received, a budget is drawn up, which includes the price and delivery date for the translation. 2. Translation: once the client has accepted the budget, translating starts. The delivery time depends on the length and level of difficulty of the document, but typically is 2-3 working days and up to 5 working days for longer o more complex assignments. 3. Delivery of translation: the certified translation will be delivered within the deadline, always in the original format, i.e personally or by email. Any document or text is susceptible to requiere a certified translation, because the aim of certified translations is to ensure the validity and accuracy of translated content. Therefore any company or individual can request a certified translation, of which the certified translator will accept responsibility by means of his stamp and signature, both registered in the database of the Ministry of Foreign Affairs and Cooperation.